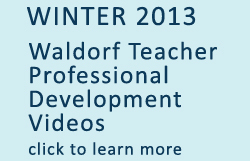 Prairie Moon Waldorf School is pleased to offer teacher preparation courses to Waldorf and other inspired teachers. These videos were recorded at our onsite training and are now available for purchase on disc for playback in computers (Mac and PC) as well as mobile devices like tablets and smart phones. All videos include original music by Adam Cantor. Learn more about his music at: www.adamcantormusic.com. Shipping outside the US will have an extra charge. These videos are part of the 15-Day Teacher Preparation Course that Dr. Robin Bacchus presented at Prairie Moon Waldorf School in June 2012. Robin Bacchus, PhD, grew up on a Biodynamic farm in New Zealand. He attended the pre-eminent Waldorf teacher education program at Emerson College in the UK and then began work in Waldorf education as a teacher in the High School at Wynstones in western UK. Dr. Bacchus helped found the first Waldorf High School in New Zealand. He then became Program Director of the Diploma in Rudolf Steiner Education at Taruna College for seventeen years. He was integral in getting Taruna recognized and registered as a college and private training establishment. This series features master teacher Robin Bacchus in a 15-day intensive offered at Prairie Moon Waldorf School. This in-service included 5 topic areas or lecture strands: Circling Activities, Anthroposophical Foundations, Anthroposophical Foundations for Classroom Management, Mathematics, and Drawing. BONUS MATERIAL: One Hour of group singing and all handouts in PDF format. All discs are video mp4 format and may be viewed on Mac and PC computers as well as tablets and mobile devices. This disc contains 15 lectures (5.5 hours) of circle activities/instruction from Robin Bacchus. 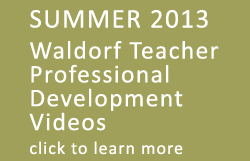 He offers valuable insights and activities that you can put into practice in your classroom immediately. This topic area includes 14.5 hours of lectures on two discs covering topics such as: What is Anthroposophy, Kingdoms of Nature, Three-fold Body, Evolution of Earth, Three-fold Social Order, Human Biography, Coming of Age, Seven Stages of Learning, 12 Human Senses, Child Profile Studies, College of Teachers Imagination and the Third Hierarchy, Strategies for Teaching, Pedagogical Law, Role of the Teacher, and the Festivals. This topic includes 12 hours of lecture on two discs on teaching Math beginning with first grade and progressing through the grades. This disc includes 10 hours of lecture in Drawing (from forms to geometry) including: Symmetry, Lemniscates, Celtic Patterns, Metamorphosis, Geometry: line/curve 13-circle net forms, Nest of Polygons, Golden Ratio, Fibonacci Series, Leaf Forms, Pythagoras Theorem, and Triangle Centers.